74 Journal of the North Atlantic Special Volume 2 The Runic Inscriptions from Vatnahverfi and the Evidence of Communication Lisbeth M. Imer* Abstract - This article forms the beginning of a planned edition of Greenlandic runic inscriptions. It deals with the runic inscriptions from the Vatnahverfi area, found on various forms of domestic utensils—fi rst and foremost on fragments of soapstone, so-called loom weights. The inscriptions indicate that the tradition of writing in Norse Greenland played an important part in the expression of Christianity, and that it had the purpose of maintaining connections with the Scandinavian Christian world. *The National Museum of Denmark, Danish Middle Ages and Renaissance, Frederiksholms Kanal 12, 1220 København K, Denmark; lisbeth.imer@natmus.dk. Introduction At present, more than 100 inscriptions, both runes and Latin letters, are known from Greenland, most of them on loose objects and only fi ve on gravestones. The distribution largely follows that of the Norse settlement as a whole, and inscriptions are known from the Western as well as from the Eastern Settlement. The most famous ones are the wooden crosses from Herjólfsnes, and the little slate from Kingitorssuaq, but many inscriptions or incisions consist of single runes or very few runes without linguistic sense, very often incised together with crosses. The inscriptions are found on objects of different kinds: amulets, plates, wooden crosses, and domestic utensils. This article concentrates on the inscriptions from the Vatnahverfi region as an example of how to deal with the communicative evidence of the inscriptions. The research is part of the two-year project “Runic Inscriptions from Greenland—An Archaeological Contextual Analysis” (working title) which in turn forms a part of the research field “Northern Worlds” at the National Museum in Denmark. For the first time, all the inscriptions from Greenland, runic as well as Latin, are collected in an investigation of the tradition of writing in Norse Greenland from an archaeological-runological point of view. In 2008, the Ministry of Culture in Denmark granted this project the first year’s resources, which enables me to work with the project part-time in 2009 and 2010, and hopefully I will manage to attract further resources in order to finish the project in 2012 or 2013. History of Research In the last hundred years, various presentations of the Greenlandic runic material have been made, pioneered by Finnur Jónsson in the beginning of the 20th century. He published the rune stones from Greenland and the runic inscriptions from Herjólfsnes (nowadays Ikigaat) and Garðar (Igaliku), i.e., the fi rst known inscriptions from the Eastern settlement (Jónsson 1914, 1916, 1924, 1929). Erik Moltke (1936) followed in his footsteps by presenting the material from the Western settlement, and at the same time, the Norwegian researcher Magnus Olsen (1932, 1949) studied the language of the inscriptions. More recently, Marie Stoklund has written extensively on the Norse Greenlandic runes (Stoklund 1981, 1982, 1984, and 1993) as well as publishing new fi nds of inscriptions (Stoklund 2001). Characteristic for the early publications of the inscriptions is the division between inscription and context. In the publications of the inscriptions from Garðar and Herjólfsnes, the philologist Finnur Jónsson (1924, 1929) concentrated on the inscriptions and the linguistic contents, while the archaeological and historical background was described by Poul Nørlund (Nørlund 1924, 1929). This division of labor has contributed to a lamentable disconnect between the inscription and its context. This means that the potential of the connecting of inscription and context has not been adequately explored and comparative and cross-sectional analyses of inscriptions from diverse settlements have not been made. The disconnect between inscription and context has been mitigated to a degree by the works of Stoklund from the 1980s and 1990s; her articles from 1981, 1984, and 1993 are especially important contributions to the understanding of the Greenlandic use of writing. 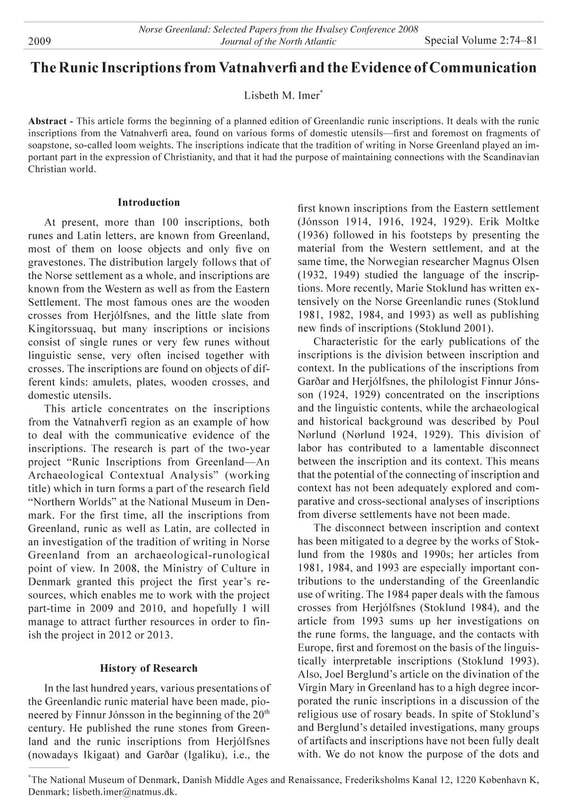 The 1984 paper deals with the famous crosses from Herjólfsnes (Stoklund 1984), and the article from 1993 sums up her investigations on the rune forms, the language, and the contacts with Europe, fi rst and foremost on the basis of the linguistically interpretable inscriptions (Stoklund 1993). Also, Joel Berglund’s article on the divination of the Virgin Mary in Greenland has to a high degree incorporated the runic inscriptions in a discussion of the religious use of rosary beads. In spite of Stoklund’s and Berglund’s detailed investigations, many groups of artifacts and inscriptions have not been fully dealt with. We do not know the purpose of the dots and 2009 Special Volume 2:74–81 Norse Greenland: Selected Papers from the Hvalsey Conference 2008 Journal of the North Atlantic 2009 L.M. Imer 75 marks on the so called loom weights, and the spindle whorls have never been analyzed in the light of the Norwegian and Icelandic ones. The differences in the use of writing between the Eastern and Western settlements, if any, have never been described, and, most importantly, the inscriptions have never been published as a whole in an investigation of the Norse Greenlandic tradition of writing, although planned (Stoklund 1981:138). Up until now, inscriptions have only been recorded if the inscription consisted of two or more runes in a row. This means that single runes and letters have been neglected, although they may play an important part in the discussion of the use of writing in Norse Greenland. The project “Runic Inscriptions from Greenland” will include all inscriptions, runic as well as Latin letters, on every group of artifact, focusing on the use of writing in Norse Greenland compared to the rest of the Norse world. Script and Language What is particularly interesting about the tradition of writing in the Middle Ages is the interaction between script and language. For the fi rst time in the history of the North, two competing writing systems are in use, letters and runes. It is of some importance to note that Latin and Norse as languages could be written both with Latin letters and runes, and vice versa. For example, the wooden crosses from Herjólfsnes were written with runes in the Latin language, whereas one of the grave stones from the same site was inscribed with letters in the Norse language. These fi ndings mean that runes were not only used to write the vernacular, and letters were not only used to express the Latin language, as might be expected. In the context of script and language, Greenland is quite different compared to Scandinavia, as Latin letters are very rare. Nevertheless, Latin as a language is very much in use in the Greenlandic runic inscriptions, e.g., the Latin texts on the wooden crosses from Herjólfsnes written in runes, as mentioned above. Only three inscriptions with Latin letters, written in Norse, are known from Greenland—for example, a grave stone from Herjólfsnes with the inscription “Here rests Hróar Kolgrímsson,” a type of inscription that is very well known in the Icelandic material (Fig. 1). The fact that the Norse Greenlanders rarely used Latin letters sets them apart from other Norse areas. Why and how this difference arose are questions that need to be considered from a much wider perspective than this short presentation allows, a perspective that involves both material and written culture in the Norse world as a whole. Dating of the Greenlandic Inscriptions The chronology of the Greenlandic runic inscriptions is extremely diffi cult to sort out. The majority Figure 1. The grave stone from Herjólfsnes with a Latin letter inscription “Here rests Hróar Kolgrímsson.” Photograph © National Museum of Denmark. 76 Journal of the North Atlantic Special Volume 2 of the inscriptions were found before the modern archaeological excavations of the 1980s and 1990s, and in most cases, it was not even recorded if the artifacts had been found in the early or the late phases of the ruins in question. The tighter stratigraphic control of modern excavations allows the dating of a handful of inscriptions, in all cases by means of radiocarbon dating of objects found in the same layers as the runic objects. Among these are most of the runic artifacts from GUS (The Farm Beneath the Sand; J. Arneborg, National Museum of Denmark, Copenhagen, Denmark, pers. comm.) and one of the artifacts from Ø34 Qorlortup Itinnera (G. Nyegaard, Greenland National Museum and Archives, Nuuk, Greenland, pers. comm.). A wooden stick from Ø34 with a lengthy runic inscription on both sides containing elements of skaldic poetry is dated to the 12th or 13th centuries (G. Nyegaard, pers. comm.). One of the inscriptions from GUS (a wooden stick with a futhark-inscription) is dated to the second half of the 12th century, and seven others have been dated to the latter half of the 13th century or fi rst half of the 14th. Although, the GUS material forms a very small part of the Greenlandic corpus of inscriptions, it suggests that writing extends through the whole period of settlement, at least in the Western settlement. However, we cannot ignore that some of the Greenlandic inscriptions are both earlier and later than these few archaeological datings suggest. The lack of archaeological context leaves us with no other possibilities than dating the inscriptions on the basis of typology of rune forms and language. Most of the comparable material comes from Bryggen in Bergen, where more than 600 runic inscriptions were uncovered during the 1950s and 1960s, but a thorough comparison of the Greenlandic and Norwegian material has yet to be carried out. We must assume that artifacts like, e.g., the Narsaq (Eastern Settlement site Ø17a) stick belong to the early 11th century, but the majority of the material shows an orthography that resembles medieval Western Norway and must be dated to the Middle Ages (Stoklund 1993:529f.). For the present, we must be content with this wide dating of the runic material. The Vatnahverfi Inscriptions In Vatnahverfi , in the Eastern Settlement, there are 40–50 farm sites—large as well as small and Figure 2. The Vatnahverfi region. Red dots mark the fi nds of runic inscriptions. Manipulated from Vebæk 1992:10. 2009 L.M. Imer 77 isolated farms (Vebæk 1992:8). In the last few years, new sites have been discovered in annual surveys of the area in connection with the Vatnahverfi project (Algreen Møller and Koch Madsen 2006a, b; Algreen Møller et al. 2007). Since the end of the 19th century, runic inscriptions have been discovered on fi ve farms of different size and layout (Fig. 2). Many of the inscriptions contain Christian elements. Ø71 is a middle-sized farm, and two inscriptions have been found in one of the living rooms in the ruins of the main house. One of them is a square stone plate with a man’s name “Magni” (Fig. 3), and the other is a handle for a spade or a shovel with the inscription “Gunnar owns” (Fig. 4). It is evident that Gunnar was a Christian, inasmuch as the inscription begins and ends with a cross, connected to the fi rst and last runes. It is also evident, as has been pointed out (Stoklund 1992:90), that he or his teacher had been in connection with the tradition of writing with Latin letters, as he spelled his name with a double consonant “nn” instead of single “n” as had been standard in runic orthography up until the introduction of Latin script and the manuscript tradition (Seim 1988:20, Stoklund 1992:90). From the farm Ø66 at Igaliku Kujalleq, a number of scratches or inscriptions are known. They are fragments of soapstone with un-interpreted inscriptions and crosses (Fig. 5). The farm at Ø66 is a highstatus farm associated with a church. At Ø171, a middle-sized farm, a single inscription on a wooden stick comes from a midden outside the farmhouse (Fig. 6). It is presumably a piece of a wooden cross of the same type as found in Herjólfsnes (Stoklund 1988:6). The stick is probably the transverse limb of a cross and is pierced in the middle. The inscription is placed on either side of this hole. In early research, the crosses were interpreted as grave crosses to be placed on the breast of the dead (Nørlund 1924), but Stoklund has argued that they were used in the living rooms of the farms as crosses for devotion for a longer period before ending up in the graves (Stoklund 1984). The inscription contains the woman’s name “Maria,” which is most likely the Virgin Mary, as it is found on most of the other crosses from Greenland. Again, we are dealing with a Christian inscription. Ø167, also known as Abel’s farm, is a middlesized farm and consists of two separate complex houses. Inscriptions are found in both houses; in the living room of ruin 1, a piece of bone was found with the inscription “bone” (Fig. 7), and a spindle whorl with a fragmented inscription was uncovered, probably “Sigrid made …” (Fig. 8). In ruin 7, two loom weights have been found in the living rooms. They both carry very short inscriptions, one of them g·i and the other tki+ on one side and g·i on the other (Fig. 9). Ø70—the mountain farm—is a middle-sized farm at high altitude. One inscription is on a fragment of soapstone (Fig. 10)—maybe a loom weight—transliterated k=ua=ra(d)i or “paradi/parati” (Stoklund 1992:91–92). This inscription may be interpreted as “paradise,” placing it in a Christian context. At the same farm, another loom weight with an inscription ki has been found (Fig. 11). The runic inscriptions come from a relatively small part of the Vatnahverfi area (Fig. 2), which could indicate some kind of centralization of writing. Yet the distribution pattern represents the excavation Figure 3. The stone plate from Ø71 with the man’s name “Magni.” Photograph © National Museum of Denmark. Figure 4. Handle of whalebone from Ø71 with the inscription “Gunnar owns.” Note the crosses in connection with the fi rst and the last runes of the inscription. Photograph © National Museum of Denmark. 78 Journal of the North Atlantic Special Volume 2 Figure 5. Fragments of soapstone from Ø66 with scratches and illegible inscriptions. Photograph © Lisbeth M. Imer Figure 6. Fragment of a wooden cross from Ø171 with an inscription containing the name “Maria.” Illustration © National Museum of Denmark. Figure 7. A piece of bone from Ø167 with the inscription “bone.” Photograph © National Museum of Denmark. Figure 8. Fragment of a spindle whorl with the inscription “Sigrid made … .” Photograph © National Museum of Denmark. activity more than it represents the actual distribution of inscriptions. The only excavated sites in Vatnahverfi are the sites mentioned above with fi nds of runic inscriptions, and the two sites at Ø64a and Ø64c, where fragments of soapstone with owner’s marks or different signs have been registered. These fi ndings indicate that inscriptions are likely to be found wherever an excavation is carried out, and that writing in some form was a widespread phenomenon. The Christian Connection An interesting group of objects is the so called loom weights with short inscriptions, rune-like characters, different kinds of crosses, and different signs, which have been interpreted as emblems or owner’s marks of some sort. It is possible that this is not the right interpretation for the whole group of these inscriptions or marks. On many of the loom weights crosses may have been incised into the object, not as owner’s marks, but as symbols that the persons making them were Christians. The kior gi-inscriptions are too frequent to be interpreted just as owner’s marks. The fact that they are often incised next to crosses makes it likely that some kind of Christian context must be sought. The short ki- or gi-inscriptions on the loom weights could be some sort of abbreviations of saints or of Christian 2009 L.M. Imer 79 prayers, and the fact that this inscription is found on a spindle whorl with a cross and a Maria-inscription at Sandnes in the Western settlement reinforces this interpretation (Moltke 1936:226). Again, this is a question that needs to be considered in a wider perspective that includes inscriptions from the Eastern as well as the Western settlements. The Christian context of the inscriptions was already pointed out by Moltke (1936:224), and Joel Berglund has made some very interesting observations about the divination of the Virgin Mary in the Norse society of Greenland (Berglund 1993), so indications on Christian elements in the use of writing in Norse society are not an unknown phenomenon. The loom weights with inscriptions and crosses have not been recorded systematically, and this needs to be done in order to be able to interpret the short runic inscriptions. This also means that we do not know, if incising crosses, runes and letters into objects of everyday use was a very common practice. However, as we fi nd fragments of soapstone with incisions on every farm— small ones or large ones—that has been excavated, at least in the Vatnahverfi region, we can presume that it represents an ubiquitous practice. Why did the Greenlanders choose to write Christian inscriptions on their objects? We might presume that the churches in Norse Greenland were privately owned, and that the church owners possessed ideological as well as the economic authority. Seen in this perspective, the majority of Christian formulae on the corpus of the inscriptions make very good sense. Of course, everyone was interested in keeping in close contact with authority—sacred as well as secular—and this could be done ideologically in attaching oneself to the people of power through, for example, the runic script. But at the same time the Christian incisions on tools and implements of every day use show us Figure 11. Loom weight with the inscription ki. Photograph © Lisbeth M. Imer. Figure 9. Loom weights from Ø167 with the inscriptions g·i, tki+, and g·i. Photograph © National Museum of Denmark. Figure 10. Fragment of a loom weight (?) with the inscription k=ua=ra(d)i or “paradi/parati,” (paradise?) Photograph © National Museum of Denmark. 80 Journal of the North Atlantic Special Volume 2 that the Norse Greenlanders were good Christians. The Greenlanders had both an inner and an outer need to demonstrate their Christian beliefs, and the inner need to express their religious devotion was demonstrated in placing inscriptions and crosses on tools and implements of everyday use. The desire to be a part of a common European Christian community might also have played a part in the Norse community’s effort to express their Christian beliefs as much as possible. The bishops of Greenland were all of foreign origin, and the history of this distant offi ce suggests that it was less attractive than offi ces elsewhere. From 1212 to 1378, when the last resident bishop in Greenland died, the seat was vacant in several instances, or the bishop was away on journeys (Arneborg 1991). When Bishop Alf arrived in 1368, there had been no bishop for 19 years. And from 1378 until the last settlers left—or vanished from—the Eastern settlement in the mid- or late 15th century, there was no bishop in Greenland at all (Gulløv et al. 2004:250). The diffi culties in manning the episcopal seat of Garðar increased as the 14th century progressed, and this increased vacancy refl ects the limited interest the central church establishment displayed towards Greenland. This lack must have been felt by the Greenlanders who, as a response, had a greater need to express their Christianity than, e.g., Norwegians who were more secure of their place in the world. One cannot be surprised that the Norse Greenlanders put some effort in connecting themselves to Christian Scandinavia in demonstrating their Christian belief as much as possible in almost every aspect of their material culture. The Scandinavian Contact and the Communication Network The maintenance and constant development of the runic script by European and Scandinavian standards, and the effort put into maintaining Scandinavian traditions of writing suggests the importance the Norse Greenlanders placed on cultural identifi cation with the old world. This implies that the Greenlanders to a considerable degree focused on the mechanisms of “homophily.” In theories and analyses on communication networks, homophily is explained as the selection of people who in culture and religion are similar. This similarity is thought to make communication between two parties easier. In other theories on communication networks, physical proximity plays an important role. Physical proximity is explained as the likelihood of communication and interaction of people when living in close proximity to one another (Monge and Contractor 2003:223–227). If we try to transfer these network theories to the situation in Medieval Greenland, it seems that while communications with Scandinavia— and Europe—decreased as a result of the very great distances in question, the intensity of that contact may have increased as a result of the functions of homophily. As the trips to and from Greenland got fewer, the Greenlanders strove harder to maintain contact with the outside world. Therefore, the functions of the tradition of writing in Greenland are closely related to the tradition of writing as well as the material culture in Scandinavia and the rest of the Norse area. Comparisons between various groups of Greenlandic inscriptions need to be made with other groups of inscriptions from the Norse world. For example, it is of interest to compare the tradition of writing in Greenland with the extremely extensive use of script in the West Norwegian communities of Bergen and Trondheim, where written messages were part of everyday life as a practical means of communication. Greenland was characterized by small settlements, and the population density was nowhere near that of Bergen. When making comparisons between the use of writing in the rural settlements of Greenland and the towns in Western Norway, it is important to note that this picture might refl ect the difference between town and country more than it refl ects the difference between Norse communities in various parts of the North. The inscriptions in Greenland to some degree differ from the inscriptions in the towns of Medieval Scandinavia. This diffference underlines the Greenlandic material as a storehouse of information for illuminating the use of writing in the country and the magnate’s farms, a tradition that, due to the conditions of preservation, can only be described on the basis of the material from Greenland. Literature Cited Algreen Møller, N. and C. Koch Madsen 2006a. Rapport om rekognoscering og opmåling af nordboruiner i Vatnahverfi sommeren 2005. SILA Feltrapport nr. 24, Copenhagen, Denmark. Algreen Møller, N. and C. Koch Madsen 2006b. Gård og Sæter, Hus og Fold – Vatnahverfi 2006. Rapport om besigtigelser og opmålinger i Vatnahverfi , sommeren 2006. SILA Feltrapport nr. 25. Copenhagen, Denmark. Algreen Møller, N., L. Lund Johansen, C. Koch Madsen, L. Felding, P. Baltzer Heide, and K. Smiarowski. 2007. Udgravninger af norrøne kirkegårde og møddinger. Rapport om opmålinger og udgravninger i Vatnahverfi , sommeren 2007. SILA Feltrapport nr. 26. Copenhagen, Denmark. Arneborg, J. 1991. The Roman Church in Norse Greenland. The Norse of the Norse Atlantic. Acta Archaeologica 61(19 90):142–150. Berglund, J. 1993. Maria-kulten i det norrøne Grønland. Grønlandsk Kultur- og Samfundsforskning 93:7–33. 2009 L.M. Imer 81 Gulløv, H.C., C. Andreasen, B. Grønnow, J. Fog Jensen, M. Appert, J. Arneborg, and J. Berglund. 2004. Grønlands Forhistorie. Gyldendal, Copenhagen, Denmark. 434 pp. Jónsson, F. 1914. Runestenen fra Kingigtórsuaq. Det Grønlandske Selskabs Aarsskrift: 3–11. Jónsson, F. 1916. Grønlandske runestene. Det Grønlandske Selskabs Aarsskrift:63–66. Jónsson, F. 1924. Interpretation of the runic inscriptions from Herjolfsnes. Meddelelser om Grønland 67:273–90. Jónsson, F. 1929. Rund inscriptions from Gardar. In P. Norlund (Ed.). Norse Ruins at Gardar, The Episcopal Seat of Medieval Greenland. Meddelelser om Grønland 74: 173–179. Moltke, E. 1936. Greenland runic inscriptions IV. In Aa. Roussel, Sandnes, and the Neighbouring farms. Meddelelser om Grønland 88: 223–232. Monge, P.R., and N.S. Contractor. 2003. Theories of Communication Networks. Oxford, UK. 406 pp. Nørlund, P. 1924. Buried Norsemen at Herjolfsnes. An archaeological and historical study. Meddelelser om Grønland 6:1–270. Nørlund, P. (Ed.). 1929. Norse ruins at Gardar. The episcopal seat of Mediaeval Greenland. Meddelelser om Grønland 74. Olsen, M. 1932. Kingigtórsuak-stenen og sproget i de grønlandske runeinnskrifter. Norsk tidsskrift for sprogvidenskap 5:189–250. Olsen, M. 1949. Sproget i de grønlandske runeinnskrifter. Fra norrøn fi lologi:52–71. Seim, K.F. 1988. A Review of the Runic Material. The Bryggen Papers, Supplementary series No. 2, 10–23. Norwegian University Press, Bergen, Norway. Stoklund, M. 1981. Greenland runic inscriptions. Michigan Germanic Studies 7:138–149. Stoklund, M. 1982. Nordboruner. Grønland 30:197–206. Stoklund, M. 1984. Nordbokorsene fra Grønland. Nationalmuseets Arbejdsmark 1984:101–113. Stoklund, M. 1988. Nyfund 1987. Nytt om runer 3:4–7. Stoklund, M. 1992. Objects with runic inscriptions from Vatnahverfi . In C.L. Vebæk (Ed.). Vatnahverfi —An Inland District of the Eastern Settlement in Greenland. Man and Society 17:90–93. Stoklund, M. 1993. Greenland runes: Isolation or cultural contact? Pp. 528–534, In C.E. Batey, J. Jesch, and C.D. Morris (Eds.). The Viking Age in Caithness, Orkney, and the North Atlantic. Select Paper from the Proceedings of the Eleventh Viking Congress, Thurso and Kirkwall, 22 August–September 1989. Edinburgh, Scotland, UK. Stoklund, M. 2001. Nyregistrerede fund fra Grønland 2000. Nytt om runer 16:8–10. Vebæk, C.L. 1992. Vatnahverfi —An inland district of the Eastern Settlement in Greenland. Man and Society 17. 132 pp.